I just did my weekly shot. For the first time, I had a gusher. When I pulled the needle out this thick, dark red, nearly black, goo oozed out of the hole rapidly, scaring the beegeebers out of me. I hate horror movies and look away when I see that sort of thing on the screen. Can't look away when it's your own blood and someone's got to do something. I pressed down really hard with my cotton ball and didn't take it away until it got to the point where the cotton ball was sticking to my leg. All this got me thinking. I am SICK of this once a week shot -- especially because it's probably just steril water I'm stabbing myself with anyhow -- and I'm sure there are many people out there who also have to stick themselves daily, weekly, several times a week, etc. and you are all hoping this Fingolimod will free you from your needles the way the 60's freed women from their bras. So I dared to peek at the calendar. To see just how many more times I'm going to have to squirm and quiver and have the "talk" with myself about how "you just have to buck up and do it" and all that. And to my delight, I was rewarded with the number 16. Only 16 more times do I have to get it out of the fridge and wait for it to warm up. Only 16 more times to try for a good spot and not hit a gusher or a twitcher. Only 16 more times to have to waddle across the room with my pants around my knees to get the cotton ball I set down "over there". 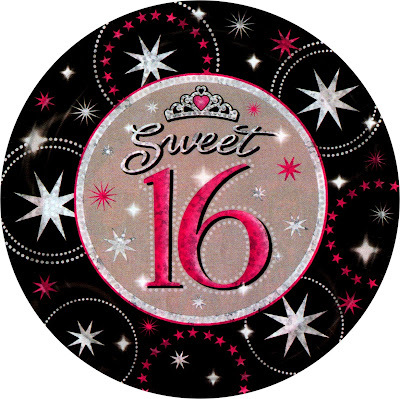 16 sounds sweet to me! How many MSers out there can actually say "I only have this many shots left to do and I'm done."? The part that has always sucked about the needles is the thought that, as long as I am breathing, this is what I have to look forward to. I know I make it sound dramatic and really it's not that bad, but it's annoying if nothing else. So today I celebrate Sweet Sixteen. I'm not happy to see the trial winding down and entering it's last downhill run, but I will never look back on any of this and say "ya know...I miss doing those shots." Been there, done that, have the track marks to prove it. It will be part of my history. Can't wait for that day! I just don't think I could do it - you are such a strong person! Ugh ... and I remember those ONCE A DAY shots. I got gusher's on a regular basis! Not much else I can offer, aside from God Bless! I didn't know how much I loved my shots until I had bad reactions / antibody buildup with all of them. MS without any way to protect yourself is scary. I'd prefer shots. But, my trial is giving me a pill instead of a shot, and that is way better. I know what you mean, Queen!! I went for a period of time where I couldn't get my Copaxone due to insurance (or lack thereof) reasons. It's just awful when MS has it's way with you. Since this trial I am a firm believer in the DMDs now. Before I thought halfheartedly that it was a drug company scare tactic. Now, in just a matter of days, it will be ONE YEAR since my last relapse!! Before that it as an every 3 month ebb and flow of MS eating away at me. If the pills don't get to market, I won't give up the shots! Believe THAT! I hit a gusher on the outside of my thigh one time and the result has actually quite hilarious. A thin stream of blood leapt from my leg, swirled in the air, and danced on my foot and the tile floor of the bathroom. Each pulse sent a new stream to fly before I could manage to get a cottonball on the offending porthole. I always wondered how come other folks, such as my boyfriend and mom, didn't enjoy hearing about this little adventure. I guess you woulda had to been there. BTW, I traveled back in time to yesterday afternoon as I was passing over northeast Florida from high in the sky. I waved atcha. But I'm home now. Back to the normal routine. Congrats on getting to the 16 mark! I've got 3 more to do myself and then they're gone! Woohoo! And surprisingly no gushers lately for me these days. Sorry to hear to had to deal with one. HAPPY SWEET 16 COUNTDOWN...have I mentioned how GRATEFUL I am that you and others are taking one for the team and being a part of this trial study???? Well, if I didn't...thank ya now. Possible Side Effect of Fingolimod?